It's easy to enjoy driving around the streets when you are behind the wheel of a vehicle that exudes performance. Every vehicle isn't built the same, so it's wise to decide on one that meets your performance needs. 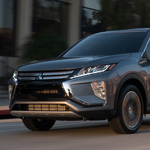 The Mitsubishi Eclipse Cross is a compact SUV that seeks to fill this need for drivers. Seeing is believing. Soon after you arrive at our dealership, you will begin to understand what the new Eclipse Cross has to over. It begins with a 1.5L Direct Inject Engine that is paired with a continuously variable transmission that comes with Sport Mode. These two components work together to heighten the vehicle's responsiveness and acceleration. The body of the new Mitsubishi Eclipse Cross has also been strengthened. The result of this improvement is a vehicle that handles better, drives more comfortably, and is safer for vehicle occupants if a collision ever occurs.